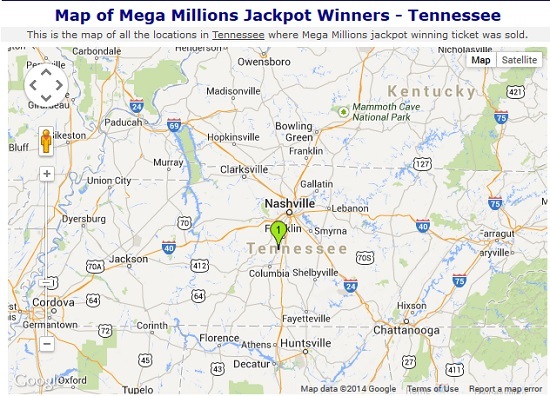 The First Mega Million Jackpot Winner from Tennessee come forward to claim the $61 million. The First largest prize of Mega Million Jackpot Winner from Tennessee Lottery come forward to claim the $61 million. The biggest lottery jackpot in Tennessee history won by the Nashville woman and her son. Bettina Still and her son, Jonathan, came forward Friday to claim the $61 million Mega Millions prize. The Stills are the first Mega Millions jackpot winners in Tennessee since the state began offering the game in January of 2010. The winning ticket was sold at a Bellevue Shell, 7395 Old Harding Pike, Nashville, TN 37221. The Retailer will received $25,000. The Mega Million winning numbers are 22,24,25,40,70 and Mega Ball number is 5. Mrs. Still told Lottery officials she and her son waited nearly a week to claim the jackpot in order to consider their options and consult with a financial advisor. They chose the lump-sum cash payment, as opposed to the annuitized amount. If they choose a lump-sum cash payout, the Stills will walk away with more than $24 million. This is the largest prize in Tennessee Lottery history and the first Mega Millions jackpot winner for Tennessee. The second-largest winner in Tennessee was a family from South Pittsburg who won a Mega Million jackpot of $25.5 million in March 2005. This marks the 131st winning Lottery ticket sold in Tennessee worth a million dollars or more.